Clock 6:08 a.m. Light on. Up. Bathroom. Face cream, toothbrush, toothpaste, pee. Wash hands, spit, rinse, washcloth on face. Dry. Clothes off shelf: sports bra, socks, t-shirt, cargo pants, belt, flannel. Cold, so take pajamas off all at once, put clothes on quick, only two shivers. Deodorant, sunscreen, brush and braid hair. Watch on left wrist, Swiss army knife on right hip belt loop, car keys in right cargo pocket, room key in left. Turn off light, pick up backpack, slide feet into Crocs. Left one still held together with hair tie, should try to fix properly. But probably won’t. Shut door, locked? Leave the building, cold wind lightly brushes cheeks, makes early dark less pleasant. Remembering warm blanket nest. Open car, put backpack on back seat, grab travel mug from cup holder, put on vest. And hat. And coat. Car is traveling office/coat closet/storage space. To dining hall. Filter, coffee grounds, flip switch. Machine moans to life. Fridge make strange protesting creaking noises. The appliances don’t want to be here either. Breakfast, not anything to savor, just food. Make sandwich: cheese, ham, hummus. White bread, John ate the last of the wheat. Coffee’s ready. Six minutes to sit, but only need four. Dishes in the bin, grab coffee mug, sandwich, banana, time to go. At the car exchange Crocs for rubber boots from the backseat. Drive just across the street to the pull off, a 30 second drive. This is dumb. Two minutes until 7 a.m., when we open the nets. Car hasn’t warmed up yet, so may as well go now. One last pull of coffee, then outside. A mist net. 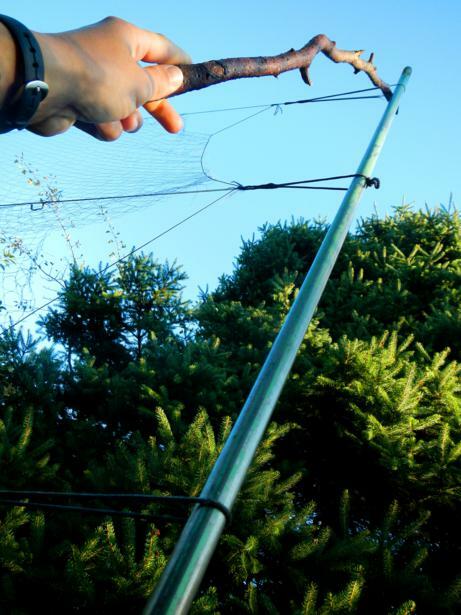 See How to Catch a Bird In a Mist Net and What Is a Mist Net? for more information about the banding process and my time in Canada. Eight nets to open, a usual routine, do this every day, seven days a week. Pull off tie, unfurl, spread trammels. Repeat. Repeat. Repeat. Eight times. Now wait for birds to get caught. If catch a bird, have to drive it down the hill to the banding station. Should have two stations, one here, one there. Faster processing time, less stress for the birds. Out of net, into bag, into hand, band, take measurements, release. That’s how it should be. No one drives birds in their car. Oh sweet Canada, Canada, Canada, of the white-crowned sparrows. Cheeseburger, cheeseburger, sing the black-capped chickadees. Zoo-zee-zoo-zoo-zee is a black-throated green warbler, foraging in the tree tops. The flycatcher is silent, and therefore anonymous. Read, sip coffee. Mostly read, and listen for birds. Arctic Dreams, then Bonk, then The Writing Life, then Eiger Dreams. 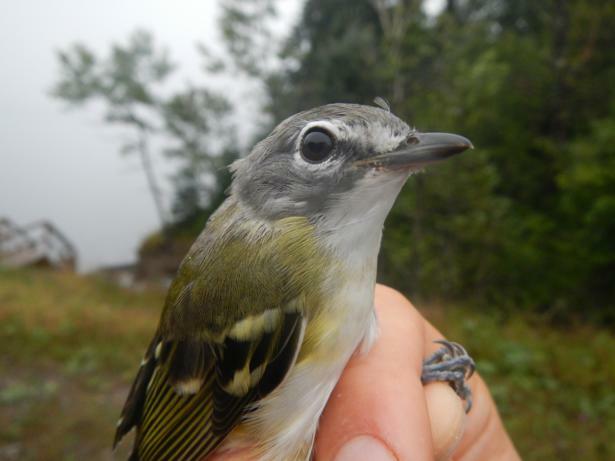 A blue-headed vireo poses questions and answers, hello, is that so? Oh, I didn’t know. Cheerio. Blue-headed Vireo. New Brunswick, 2013.